In 1901 the family were living at 84 Eccles Old Road, Pendleton, Salford, Lancashire (Census RG 133715), though Norman was not living there with them - possibly away at School. He was educated at Bilton Grange and Rugby. He entered the School in 1897 and left in 1901, before working as a civil engineer with Messrs. Edward Nuttall and Co., Trafford Park, Manchester. On the 18th February 1910 Norman sailed on board the "Manchester Shipper" from Manchester to St. John's Canada. He returned, sailing from New York to Glasgow on board the "Columbia", on the 28th August 1910. In 1911 (Census RG 14/21631) Norman was boarding with the Banner family at 4 Trentham Street, Runcorn, Cheshire and gave his occupation as "Engineer Contractor". There is no record that Norman married or had any children. Probate Records, published in 1916, show that Norman's estate, left to his father, amounted to £225 4s. 2d. [£225.21] - a relative value of £13,320.00 today (2014). In September and October 1916 Norman's 'effects' were returned to his family, amounting to £112 12s 4d (£112.62 - about £6,988 today - 2016). N.B. The 1911 Census shows that Norman and Charles' cousin Adolphe Albrecht Vaudrey was staying with the family in Buxton. He also joined the Manchester Regiment as a Lieutenant and from 6th January 1916 was transferred to the Royal Flying Corps as a Captain. (London Gazette 31 March 1915) He was later Mentioned In Despatches and awarded the Military Cross and the OBE. On 29th August 1914 Lord Derby placed the following announcement in the local press appealing for men to form a new Service battalion: "Such as clerks and others engaged in commercial business who wish to serve their country and would be willing to enlist in a Battalion of Lord Kitchener's new army if they felt assured that they would be able to serve with their friends and not to be put in a Battalion with unknown men as their companions". So successful was the appeal that by the 3rd September the Battalion was complete. In September, 1914, Norman obtained a Commission in the 17th Manchesters. After 15 months training on the 8th November 1915 the Battalion embarked on the troopships at Folkestone and endured a rather choppy crossing to France, arriving in Boulogne in the late afternoon. The Battalion joined 90th Brigade, 30th Division. By the morning of 1st July 1916 Norman's Battalion had assembled in Cambridge Copse and at 8.30 a.m. moved forward with the 16th Battalion along the east side of Talus Boisé. The assembly trenches for the Battalion had been dug in two lines on the reverse slope of a slight rise with 'A' and 'B' Companies occupying the first line of trenches and 'C' and 'D' the second. The Official History notes that the advance of both Battalions was with remarkable steadiness and enthusiasm. As the men reached the top of the slope some 100 yards in front of them, shrapnel and machine gun fire began to take its toll. Only 400 yards from his original starting position, the Commanding Officer, Colonel H.A. Johnson was wounded. Major MacDonald assumed command of the Battalion and pressed on with the assault. The assault was carried out at slow walk as the amount of extra kit carried by the men made anything else impossible. They reached Train Alley and awaited orders to move on. 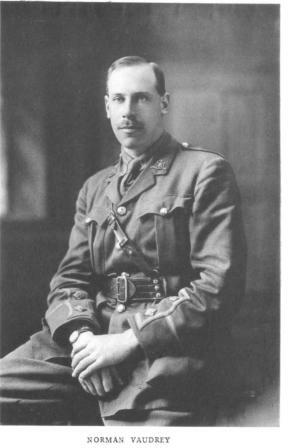 Norman commanded "B" Company in the 17th Battalion's attack on Montauban. Writing in his diary, Kenneth Callan-MacArdle said that Vaudrey used to enjoy early morning parades. On the morning of the 1st July 1916 'A' and 'B' Companies occupied the first line of trenches and at 8.30 a.m. the Battalion left the assembly trenches and proceeded up the slight rise. “Immediately, we started to consolidate, working like demons. In a short time, scraps of information were coming in from other companies and particulars of our losses. Vaudrey and Ford killed, Kenworthy wounded, the Colonel last seen in a shell hole with the M.O. in attendance. The Battalion was relieved, at 3.00 a.m, on the 3rd July, 60 hours without sleep, by the 12th Battalion, Royal Scots, and withdrew to Bronfay Farm, Carnoy. 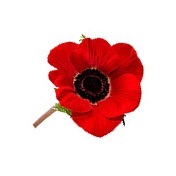 Out of 900, 8 officers and 340 other ranks were casualties (of whom, 127 were fatalities). “We were relieved in a hurricane of shells. We trailed out wearily and crossed the battlefield down trenches choked with the dead of ourselves and our enemies – stiff, yellow and stinking – the agony of a violent death in their twisted fingers and drawn faces. There were arms and things on the parapets and in trees. Shell holes with 3 or 4 in them. The dawn came as we reached again the assembly trenches in Cambridge Copse. From there, we looked back at Montauban, the scene of our triumph, where we, the 17th Battalion, temporary soldiers and temporary officers every one that went in, had added another name to the honours on the colours of an old fighting regiment of the line - not the least of the honours on it. "The sad news has been conveyed to Sir William and Lady Vaudrey, The Gables, Buxton, that their second son, Captain Norman Vaudrey has fallen in action. 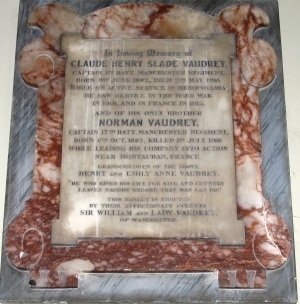 Only a few weeks ago the death of their elder son, Captain Claude Vaudrey, was announced. The sympathy of the town goes out to the parents in their great sorrow." There then followed a number of letters expressing "the sterling value and fearless character of Captain Vaudrey, and will teach us to be proud that he ever lived amongst us." Dear Sir William - I am writing to tell you of the great loss the Battalion has sustained and express to you the great sympathy of officers and men for lady Vaudrey and yourself in the loss of your son, Captain N. Vaudrey, who was killed in action on Saturday morning, July 1st, whilst gallantly leading 'B' Company into action. Briefly, the 16th and 17th Battalions were in the firing line, and having passed over the German trenches were advancing on a village about 600 yard in rear when the first Company ('A' Company) was momentarily held up. Captain Vaudrey, commanding the second Company, went forward to ascertain the cause of the halt in advance when he was hit in the stomach by a bullet from a German machine gun, and died in 30 seconds in the arms of a Sergeant who was himself killed later. When I commanded 'B' Company when first joining the Battalion, your son, Norman, was one of my subalterns commanding No. 6 platoon, and I always found him a most hard-working, reliable Officer, and excellent fellow in every way; his death is a great loss to us all. A few days ago when Captain Vaudrey and I had a stroll together, he was telling me about the loss of his elder brother and I mention this to show you how difficult this letter has been to write, and to ask you to kindly excuse any awkwardness in expression. Norman's loss is continually on my mind and I do not feel up to writing, but to delay would be unkind to you. The Battalion came out yesterday morning and is in bivouac. The 16th and 17th Battalions have done splendidly as the Brigade General told me yesterday: "They have done magnificently and they advanced as if on a Field Day on Salisbury Plain". Captain Vaudrey has set all ranks an example of courage and devotion to duty. Manchester may well be proud of her sons; unfortunately she cannot either know or appreciate what they have done until the end of the War. Dear Lady Vaudrey - After the battle a few days ago, I found the body of Captain Vaudrey in our trench, and I had him properly buried. I found an envelope with your address by his side. There were no other personal effects on his body. Please allow me, your Ladyship, to express my deepest sympathy. Everything has been a great success and "Who dies if England lives?". I was injured the following evening in the next attack and should I be lucky enough to get sent home, will give you some more particulars. By our trench, I mean the captured German trench. Assuring you of my deepest sympathy. Norman was one of the 120 Officers and Other Ranks killed on the first day of the Battle of the Somme. The letter above shows that he led his men to their objective in capturing a German trench, but perished in the process. He is one of only 21 with a known grave, the remainder are commemorated on the Thiepval Memorial. Norman now lies alongside 11 of his comrades from the 17th Battalion in Danzig Alley British Cemetery. on active service in Iraq. · Norman is also photographed in "17th Manchester Regiment on the Somme"